Precious metals futures climbed together for the first time in a week. The biggest winner on the day was palladium, registering its fourth straight record settlement. Gold for February delivery rose $6.10, or 0.5%, to settle at $1,292 an ounce on the Comex division of the New York Mercantile Exchange. "The safe-haven metal erased modest overnight losses as the U.S. dollar index resumed its recent downtrend and fell to a 2.5-month low," Jim Wyckoff, a senior analyst at Kitco Metals Inc., said in a report. "A surging crude oil market also supported the metals market bulls today. Gains in the precious metals were limited today as global equity markets are still in rally mode." Gold futures ranged from a low of $1,280.90 to a high of $1,294.50. They declined 0.3% on Tuesday and rose 0.3% on Monday. Last Thursday, they finished at $1,294.80 an ounce for their best settlement since June. 14. Ending higher for the first time in four sessions, silver for March delivery added 2.2 cents, or 0.1%, to end at $15.735 an ounce. Silver futures traded between $15.63 and $15.83. They lost 0.3% on Tuesday and slipped 0.2% on Monday. Last Thursday, the metal registered its best settlement — at $15.797 an ounce — since July 16. April platinum gained $3.50, or 0.4%, to $825.30 an ounce, ranging from $822.60 to $829.30. Palladium for March delivery rose $8, or 0.6%, to $1,269.40 an ounce — another new record close. Palladium prices traded between $1,264.60 and $1,283.80. 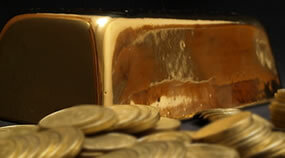 Gold rose $2.15, or 0.2%, to $1,288.60 an ounce. Silver declined 2 cents, or 0.1%, to $15.62 an ounce. United States Mint bullion sales rose by a combined 2,650 ounces in American Eagle and Buffalo gold coins; 125,000 ounces in American Silver Eagles; and 1,800 ounces in American Platinum Eagles.